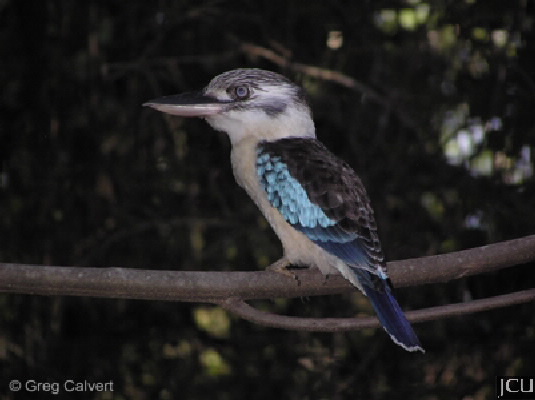 The blue-wing kookaburras usually occur in groups, particularly in woodland areas. 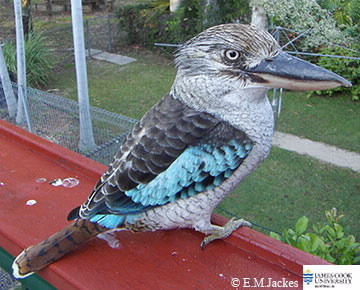 Here the female is larger than the male, and is easily distinguished by the brown strongly barred with darker brown tail in contrast to the blue tail of the male. Head off-white streaked with brown, lacks a broad dark dark streak. Upperparts brown with blue particularly on wings and rump. Legs and feet olive to yellowish, eyes whitish, bill large dark above and horn-coloured below.